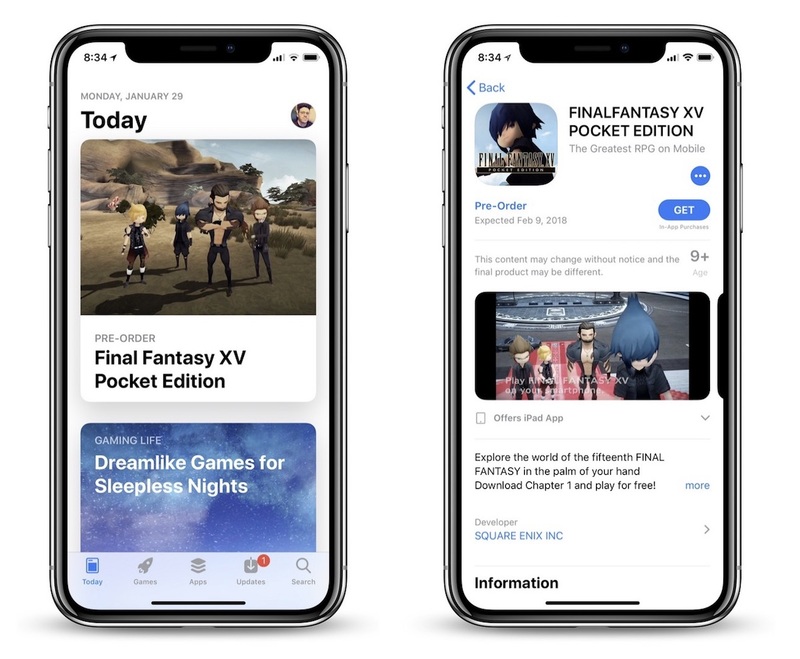 A new card on the iOS App Store today confirms that Final Fantasy XV: Pocket Edition will launch on compatible iOS devices on February 9, a few months after being announced last September. Players interested in the game can use the App Store's new pre-order ability and tap "Get," and when the game releases it will download onto their device and notify them that the game is available. Final Fantasy XV: Pocket Edition is an episodic game, with Chapter 1 up for pre-order today for free. Chapters 2-3 will be available for in-app purchases of $0.99 each, and Chapters 4-10 will cost $3.99 each. There will also be a combined bundle of all chapters to download for $19.99 (via TouchArcade). In terms of gameplay, the game is a mobile-friendly version of the mainline Final Fantasy XV game, which launched on PS4 and Xbox One in the fall of 2016. To fit on iPhone and iPad, Final Fantasy XV: Pocket Edition includes tap controls to move, talk, and fight, as well as a more stylized, "cartoonlike" art style. During PAX West in Seattle, TouchArcade spent about 20 minutes playing the mobile game, and described it as "surprisingly one to one with the 'full' console version of the game." The game is everything we'd hoped it would be, and the first playable episode seems surprisingly one to one with the "full" console version of the game. All of the dialog is there, the quests seem the same, the level-up system feels identical, and overall it looks as if they're delivering on the promise of having a full-featured version of Final Fantasy XV for mobile. Details are still few and far between regarding when it'll specifically be released, but, it's going to be a premium episodic game with the first taste that we played given away for free. Just like the console version, the iOS game follows the story of Prince Noctis and his friends Gladiolus, Ignis, and Prompto as they face enemies and danger en route to Noctis's wedding to Lady Lunafreya. Although the graphics and combat system in the iPhone game are pared down in comparison to the console title, Square Enix said that Final Fantasy XV: Pocket Edition "contains all of the main characters and main story of the console and PC versions, with the freedom to play whenever and wherever you want." Final Fantasy XV: Pocket Edition will run on iOS devices with iOS 11.1 or later, including iPhone 6s or later, iPad Pro, 5th generation iPad or later, iPad Air 2 or later, and iPad mini 4 or later. The game will also take around 5GB of space or more on each device. This is one part of MacRumors I don't like. Their application advertising. Stuff like this should be left to the iOS game focused websites. If there is an upcoming prominent game release, and there is buzz about it, why SHOULDN'T MacRumors write about it? It's the same as writing about an upcoming movie or product release. No, other developers don't "deserve" fair time. Movie reviewers don't give equal time to every single movie either. I'm GLAD they do it. I've found a number of game treasures through MacRumors that I otherwise would have missed. I commend them for pointing these out. Games release every day on the iOS app store. Advertising a few of the ones you like, really is not fair because all the others miss out. There's a lot of great iOS games that rarely get mentions on major tech sites. Sinply because they are indie and not released by major studios. "A big developer releases another game. Oh lets quickly get an article out about it so we can get those sweet sweet page hits"
That's all it is. The lesser known gems in the iOS store? Simply not cared about because artlcies on them don't being in those page hits you so desire. It’s on the iOS blog. Without these, all we’d have would be the same copy/paste article saying another iOS beta has been released. To be fair, it isn't MR's job to promote the lesser known gems in the app store. Their job is to drive interest to the articles on their site. If it's an article about FF or an article about Pokemon, should it matter?